Acne is often synonymous with the developmental stages of puberty. However for some, it can be a chronic condition persisting well into adulthood. 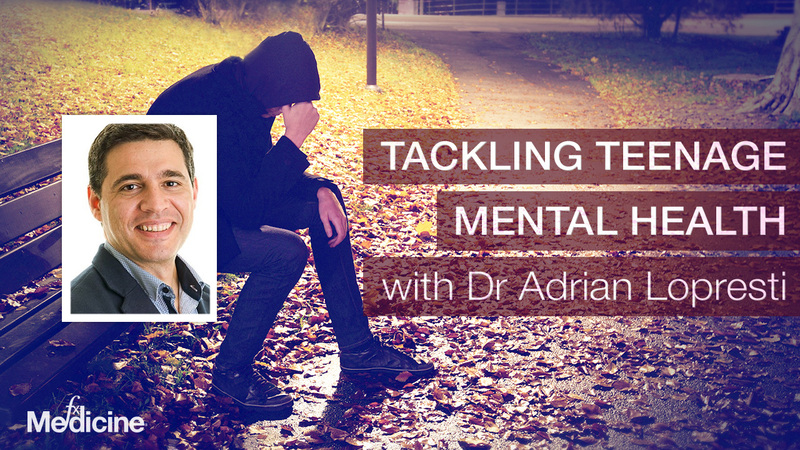 The impact is more than just physical, having far-reaching impacts into a person's mental, emotional and social wellbeing. It's these psychosocial aspects that have driven naturopath Rebecca Hughes to specialise in this crucial area of healthcare in her clinical practice. In today's podcast Rebecca takes us through the critical, foundational aspects to address when treating adult acne from gut restoration and nutritional support to fortifying skin hydration and integrity. Rebecca also reveals some of the intriguing hormonal connections to adult acne, and how she tests for, and manages them in her practice. This podcast showcases Rebecca's clinical expertise and her passion for helping patients overcome their challenges with acne. [33:18] How prevalent are toxins as contributing factors? [34:52] What do we know about skin types, or genetics? [42:48] How important is hydration? Andrew: This is FX Medicine, I'm Andrew Whitfield-Cook and joining me on the line today is Rebecca Hughes. Rebecca has been involved in the natural health industry for over 12 years since completing a bachelor of naturopathy in 2003 at Southern Cross University. 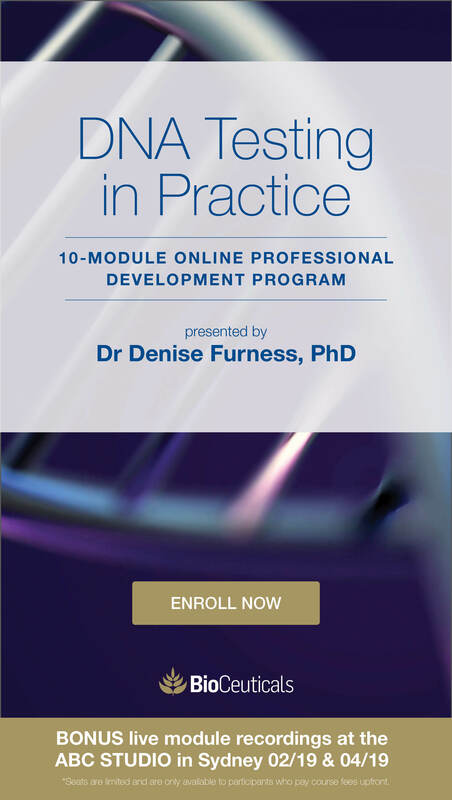 In addition to private practice, Rebecca has previously acted as a regulator of medicines at the Therapeutic Goods Administration, TGA and managed a government project funded by the Commonwealth National Health Department and Medical Research Council to create clinical guidelines for health professionals. She has also peer-reviewed naturopathic academic texts prior to publication and authored four chapters for the current edition of a popular reference text, Herbs and Natural Supplements: An Evidence-Based Guide, which is a seminal book that every natural health practitioners should have in their clinic. Currently, she balances her client time with teaching in naturopathy and nutrition bachelor programs at Endeavor College of Natural Medicine, Melbourne. In late 2014, Rebecca conducted a clinic-based prevalence study measuring the prevalence of Metabolic Syndrome in a standard clinic population. The results of this study were presented at the 2015 NHAA International Conference. Rebecca is particularly passionate about helping people with acne from her own personal experiences with this as a young adult. Now a naturopath specializing in acne treatment and other skin conditions, Rebecca is having incredible results treating acne sufferers by addressing the hormonal causes of the acne and is dedicated to returning self-confidence to teens and adults. Rebecca, welcome to FX Medicine. Andrew: I've got to say I am extremely impressed by your acumen, but also your care. Because, you know, when a practitioner has, you know, a certain condition, that personal experience, it really builds a fire to become expert in it. And I can see that you have done that because I've met you and you have an extremely beautiful complexion so it's obviously worked. So I guess, first, tell us about your background and why was it, apart from this personal journey, why specialise in skin? What was it that attracted you to it in naturopathic care? Rebecca: Well, I think sometimes things and areas of clinical practice choose you. I'm not sure that you always get the benefit of choosing them. I originally… I was seeing a lot of children with eczema and then adults with eczema as well, with really chronic eczema. And I suppose that started to develop my interest in treating skin conditions. And, of course, I did have my own personal experience with this condition as a young person and it wasn't until I started treating a couple of people with acne that I saw that actually it's easy for me to treat acne, but it's such rewarding work. And I just really want to thank you for giving me the opportunity to speak about it today. Because acne has been recognised as a chronic disease, and the mental health impairments scores for acne sufferers are as high, if not higher, than for psychiatric conditions or chronic diseases like epilepsy and diabetes. Rebecca: Yeah, it's an enormous effect on people's mental health as well as their physical health, they have higher rates of depression, anxiety, and suicidal ideation. And they have higher unemployment rates than people without acne. So the effects are far-reaching. It's not just a skin condition. And that's why I really loved treating it. And I really want to give people a sense of, I was going to say hope, but hope even seems insufficient. That actually there is a solution to their acne and there's a solution without the use of what I believe to be, fairly harmful prescription pharmaceuticals that are generally used to treat acne. Andrew: Yeah. Well, they are pretty well known to be harmful, particularly in certain populations. But what I find is really interesting is I met a dermatologist and one of the standard front-line prescriptions for acne is low-dose antibiotic. Working as an anti-inflammatory, not so much an antibiotic. Now, that's in an infective situation, i.e., it doesn't reach a minimum inhibitory concentration, an ‘MIC’. That is not to say that it's not wrecking your microbiota, which is another argument totally. Andrew: But what I thought was interesting is this dermatologist was actually saying on, "Oh, I don't like the use of long-term antibiotics because blah, blah blah." And I'm going, "What? Where has this awakening come from?" It was really strange. But that really amazes me. I do remember, you know, my old, nerdy, uncomfortable, angsty high school days, and I had acne and I was a shocker for picking them. And I remember the inner dialogue, and I, by no means did I have the worst acne. There were people with much more cystic acne than I. And I understand that real judgment that people have. Because it's the first thing you look at it as a species. You're identifying as one of your own species. And when you see a wolf or a human and you see that human who looks different, you want to analyse it to make sure everything's okay. So I can fully understand that. That would really play havoc on one's self-esteem. Rebecca: Well, that's why I do what I do. It's not just obviously just to get rid of...yeah, you want to resolve the acne, but it's really what the acne is causing in other spheres of life that is actually the impact. You know, there's sometimes there's pain associated with the acne. Not everyone has pain, but some people have pain. But it's more the psychosocial, emotional impacts that concern me. Andrew: So take us through the different forms of acne, because I'm going to, sort of, guess here that there's a lot of interplay. Rebecca: ...and some people have fairly superficial lesions where it's mostly papular or pustular. And that's the extent of the depth of their acne. It still can be quite diffuse, like it can be, you know, all over their face or you can get papular-pustular acne on chest, is very common as well. And then I would say then the next level in severity of acne is nodular acne. Which is I suppose, commonly called cystic or hormonal acne. Where the lesions themselves are much more inflamed and enlarged and they take much, much longer to resolve and they can leave greater scars. And nodular, cystic acne, I'm not going to say absolutely, but typically, it appears to be around the lower area of the face and jawline, the neck, and shoulders and back. That tends to be the location of that type of acne. I mean, there are acne severity rating scales. There's various different rating scales based on the number of comedones or lesions and, you know, and that's more used… I guess those severity rating scales are used a lot in clinical trials to determine selection of participants in trials. There are two more conditions that start with the name acne. So, acne rosacea, which isn't really related to acne vulgaris. The acne vulgaris is the one that I previously described. Acne rosacea, look, the jury is still pretty much out on what the pathophysiological cause of acne rosacea is. But that tends to affect more-so blood vessels. And there can be small pustules that's associated with acne rosacea, but it's certainly quite distinct from acne vulgaris. And then there's another condition called acne inversa. And it's probably called that because the full name is really long and complicated, which is Hidradenitis Suppurativa. Andrew: Yes, it is confusing. Andrew: Yeah. So can I briefly ask, I know this isn't the main point of our topic, but acne inversa; pathophysiology, is that an infective agent or an immune-mediated disorder? Rebecca: It's multifactorial, and I think the traditional pharmacological treatment gives you an indication of that. And there's some fairly, again, heavy-handed pharmacy that’s used, like, immunosuppressants, so chemotherapy essentially. And prednisolone and, again, long-term antibacterials. So that type of medication is used. Having said that, I don't know that people with acne inversa seek out naturopaths. I think they should, because I've only treated one patient with acne inversa and I got a really fantastic result with quite a foundational naturopathic approach let's say. Andrew: Yeah. Absolutely. So back to acne vulgaris, take us through the underlying pathophysiology, the underlying factors. Rebecca: Well, I think it's a multifactorial disease that does have several risk factors. Now, it's a disease of the pilosebaceous unit, which is, you know, a fancy name for the hair follicle basically. And the hair follicle has a sebum sac attached to it. And what happens in acne, in any kind of acne vulgaris is that there's a hyperproliferation of keratinocytes that forms a plug combined with the sebum of the hair follicle and that forms a nice environment. Well, it becomes inflamed, and then the inflammation may or may not become an environment for bacteria. And so then it can become a nodule or a pustule or a papule depending on the severity of the inflammation and infection at the site. So that's what happens, essentially, structurally. But in terms of what causes that to happen, I think that there are many factors that cause that to happen. And I also don't think that they're the same factors in every single person who has acne, either. And unfortunately, I think that's the way it is treated, that all acne is the same. And there's plenty of literature about propionibacterium acnes or P. acnes as the causative agent hence the long-term antibiotic therapies. But I think that's an overly simplistic way of regarding the human microbiome. 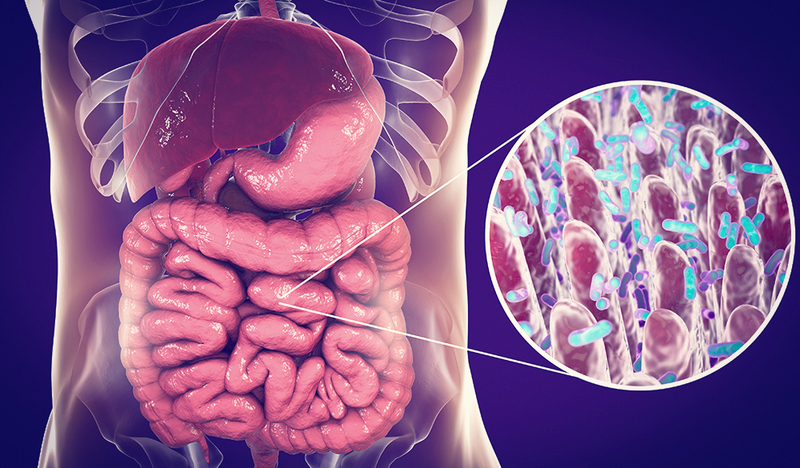 Because the microbiome on the outside of our body is just an equally as complex as the microbiome on the inside of our body. Rebecca: And I think P. acnes constitutes less than 6% of the microbiota on our skin. So, if there is an imbalance in the populations of P. acnes then I think the question to ask is, "Why is there an imbalance of that bacteria on the skin?" Rebecca: And I think one of the issues with acnes sufferers is that there’s a tendency to over-cleanse and over-wash and particularly with anti-microbial agents. So that would be causing an imbalance of microbiota. But P. acnes is considered to be a commensal bacteria when it's in normal populations. But I think it when it exceeds that limit that it's considered to be pathogenic. But that's the same with many bacteria. Rebecca: Yes, I mean, the bacteria is there and it is considered to be one of the causative agents. But there's also the… what causes there to be excessive sebum production? Well, that can be androgens, but androgens can be activated by, as I saw in one...there was a very, very good paper published recently, Dietary Glycemic Factors, Insulin-Resistance and Adiponectin Levels in Acne Vulgaris. And it's probably one of the more convincing papers around Glycemic Index and Glycemic Load and its effects on acne. Because prior to this, there have been a number of reviews done, but they've all been inconclusive saying that there's really no... nobody could really say when they combined all the data that there was any impact of diet on acne. But this paper showed that irrespective of serum glucose, serum insulin, insulin-like growth factor… With all those being the same between the match controls and the study participants, that Glycemic Load and Glycemic Index stats were higher in the acne group. Rebecca: Now, it was a small cohort. It was only 50 people of acne sufferers so I think that, you know, you'd need a higher-powered study to really show. But that, that was interesting, I thought. But at the same time, having treated quite a few people with acne by now, I would say, again, it's not absolute. I have patients who I treat, who have better diets than I do and I'm a naturopath and a nutritionist. And they have the cleanest diet and lifestyle and still have cystic acne. So I don't think you can, sort of, put all people into the same box, so to speak. Andrew: And this is the problem with medicine. When you're looking at a population level is it's kind of like saying probiotics for antibiotic-associated diarrhea generally fail. But then, well, that probiotics, not probiotic. Not strain, not species, not...there's no delineation. It's probiotics. So, you know, Jason Hawrelak will argue that vehemently that it's strain-specific. You can't necessarily say the attributes of one or the successes of one strain would negate the failures of another strain and end up with a generally positive aspect on any sort of given...Now, that's in probiotics. Take acne, and you've got all these multi-factorial issues going on. How do you then tease that apart and lump them all together and say, "See, it's not related to diet?" Because I remember this argument in, I think it was in Medical Journal of Australia, and they were saying, "Diet has no part to play in acne." Boom. And then not one month later, "Ah, sorry guys, diet is important in acne." It was just seriously within a month. 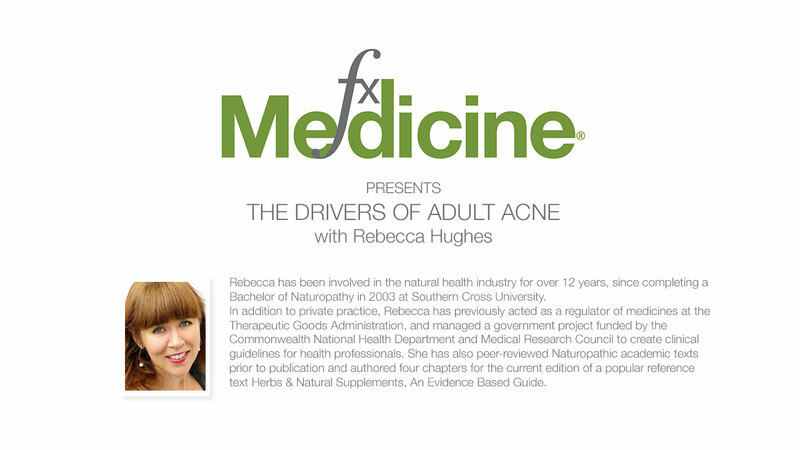 Rebecca: Well, and I think, and what I've been exploring in my clinical practice is the hormonal drivers for acne. Because most acne happens at adolescence. Rebecca: It starts during that time, or if it doesn't start during that time, it happens during another pivotal time of hormonal development in someone's life. You can probably only say that for women, because for some women, their acne only starts maybe post-pregnancy. Rebecca: That's another time in a woman's life when acne can start. It’s usually much more transient. But I think when you can identify that the acne has started during hormonal development, is… has cyclical aggravations that are coincident with the menstrual cycle, may or may not be relieved by the oral contraceptive pill. I think you can safely say that there's a hormonal driver at play, even if you don't know what the hormonal driver is. 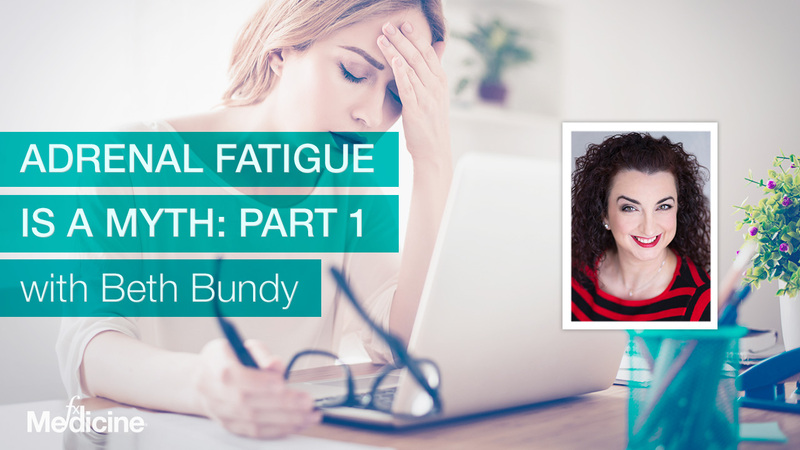 So yeah, what I've been exploring as one of the primary tools beyond the foundational naturopathic treatment, and I can talk about that in more detail as well if you like? Rebecca: …As my main tool. And for identifying exactly what those hormonal imbalances are. And I've found it to be extremely specific and an extremely valuable clinical tool. Because once I've done the foundational work, then I can really hone in on what precisely is driving this situation? What is the hormonal imbalance and how can I correct for it? And that's what's getting the lasting results. Andrew: Okay. Can I ask you a question on that hormonal measurement? Andrew: Are you measuring hormones in the system, as in production, or are you measuring metabolism on biotransformation? And indeed, you can go back into reabsorption there, I guess. Like, you know, the interplay of the gut. Which one are you measuring? Rebecca: Yeah, it's metabolism and biotransformation. Andrew: Got it. So you're looking at the hormonal but specifically the estrogen metabolites? Rebecca: Yeah. And it's particularly useful. And these are the patients that come to me with their blood test results and say, "The blood tests have been done, see, there's nothing wrong. It's all normal." Andrew: Yeah, it's all normal. Quote, unquote. Andrew: Depending on if you're looking right rather than left. Rebecca: Yeah. And, look, these test methods were developed originally for.. to predict... I think they were originally developed to detect breast cancer risk. They were looking at estrogen metabolites, 16-hydroxy and 2-hydroxy ratios as a predictor for breast cancer. But I think that they can be applied in many areas of reproductive life, not just whether someone's at-risk of a hormone-dependent cancer or not. Andrew: Oh, yeah. I think we've got to pay homage to the job of estrogen, and that is to proliferate. And so it's great for skin to make it plump and plush. As long as it's controlled well. It's great for fertility. It's great for bone and cardiac health, as long as it's metabolised right. And it's protective as long as it's metabolised right. So, I mean, I'm really interested in the hormonal metabolism aspects. I think it was at least one of the early players was H. Leon Bradlow and and Firestone..? There's a few others. Eleanor Rogan, I think, came in a little bit later. But there's quite a few of these early players. What was the other one? Zoo and Connie. I'll always remember these guys. Andrew: Yeah. But they looked at a myriad of these estrogen metabolites in, I think it was Carcinogenesis 1998. Yes, I am weird. But there was still conjecture as to how relevant it was for to predict breast cancer given that there's so many other players in causation of breast cancer. But I think it's really interesting what you're doing because you're now looking at detox. Andrew: So you're now looking at how the body handles things once they've done their job to get rid of them. So that's very interesting. Rebecca: Yeah, which is why the beginning of my treatment is generally all about how are the organs and systems like lymphatics, digestion, liver, gallbladder, kidneys, are they all doing the job that they should be doing? Rebecca: And how is the health and the integrity of the digestive system? Is there inflammation? 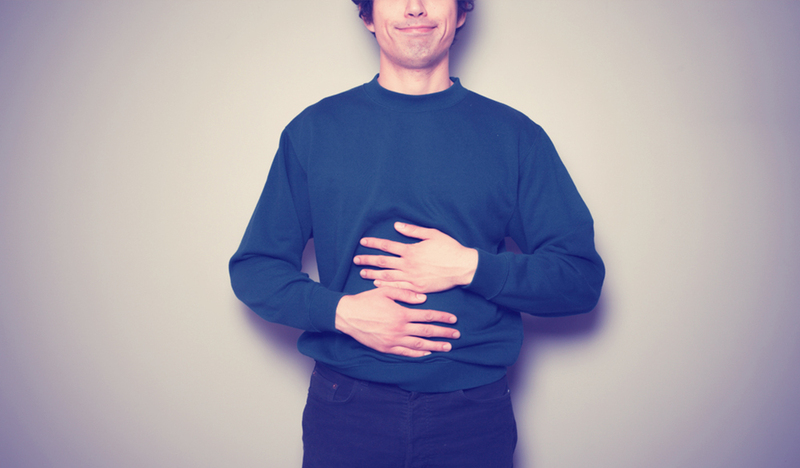 Is there dysbiosis? There is… and I've got to say like there's a lot of dysbiosis in people who have acne because almost all of them may have, at one point, done long-term antibiotic therapy. Rebecca: It's very unusual to find someone who comes to me who hasn't gone part or the whole way down the Orthodox route. And I really wish people would come to me first so that I didn't have to do all the corrective work. Because then I have to correct, for a lot of damage that's been done, as well as support normal, healthy detoxification and metabolism. Andrew: Yeah. So can I ask you a question there? Do you find that the, what 14 species, that we have available as probiotics in Australia. And given that most of them are based, not all of them, but most of them are based on milk products, that's sort of where this premise of probiotics, sort of, came from? Do you find they’re enough? Andrew: To help correct dysbiosis? Or do you have to employ plant-based material, diet and indeed herbs to help correct dysbiotic pictures in people with acne? Rebecca: Oh, I almost always prescribed prebiotics at the same time. Either in.. well, I might do it in medicine for the first few steps to make sure that we get...I mean, ultimately, you want the best value out of your probiotic. So you want to be having adequate prebiotic sources as well as probiotics. And if I’m… if the diet quality is quite poor, then, I might supplement with prebiotics until I've done the educational work to improve diet quality. And so, I just use, you know, simple things that might be like, you know, guar gum, slippery elm, pectin, things like that. They're pretty basic and in combination with the probiotics. But I also use, not that this is related to dysbiosis with, it's more about digestive integrity. I also lactoferrin, if there is significant inflammation. And you can tell because some people's acne is, and this again, it's looking at the presentation and not treating it all as the same. Like, some people's presentation is highly inflamed. Like, the acne is really red and, in fact, all their skin is really red, even the areas that don't have the acne. And so it's obvious that there's inflammation present. And when there's that degree of inflammation present, you can extrapolate and say that, "Well, the digestive tract isn't, you know, doing as well as it could." And then for some people, it's not. So I may not use lactoferrin. Because lactoferrin is a reasonably expensive product. So I don't want to use it with everyone if they don't need it. But if there's significant inflammation, then I use Lactoferrin and maybe Saccharomyces boulardii. But if there's not, then I'll focus more on large bowel health. And ensuring that there's adequate, yeah, adequate digestion. Because I do find that there is... I mean, there are some papers actually linking the, sort of, this whole of theory, gut-brain-skin theory and saying...I think I read a paper that...and it was not looking just at acne, but all seborrheic skin conditions and saying that...I think they estimated that about two-thirds of people with seborrheic skin conditions had a pre-existing or concomitant digestive disturbance. For example, irritable bowel-like picture. And I think it was...no, it was in a Chinese population, but it was about 20,000 people that they surveyed, so it was a good cohort. So there is possibly some, you know, something linking, you know, digestive health fundamentally with acne. Again, as a naturopath, I don't make absolutes. Andrew: Can I ask though, you know, I've had rather dramatic results of using cold colostrum with vulvovaginal candidiasis and bacterial vaginosis. Now, given that that's the other end of the body, and given that you, you know, normally, unless you've picked the pimples or the acne, there's normally a layer of skin on top. Have you ever used things like lactoferrin, probiotics or indeed colostrum, topically? Rebecca: ...you know, that's been formulated as a topical preparation, but there are overseas. Rebecca: There are internationally and I'm keen to start using that. Rebecca: Because even in 1930, there were a couple of dermatologists called Stokes and Pillsbury who all the way back then, they were the ones that sort of came up with this gut-brain-skin theory. And they started using and supplementing with just, you know, not even strains, just species of Lactobacillus and Bifidobacterium and cod liver oil. Can you believe it? Rebecca: And they were getting great results, but unfortunately, when they were doing this and developing this theory, it was during a particular trend in dermatology away from autotoxicity. Rebecca: So they just weren't given any airtime really. Rebecca: So they were using that. And apparently, there's a strain in most yogurts, the second part of it is Thermophilus? Rebecca: Yeah, that increases ceramides when it's applied topically. Rebecca: Yes. So you could get your tub of yogurt out and try it on your face. Andrew: This is one of these things. You know, we find these old ‘grandmas' tales’. This is the thing that I say a little bit glibly, but with some air of meaning, and that is, these old wives' tales only remained ‘old’ if they worked. Otherwise, they wouldn't get told again. Andrew: You know. Now, I was going to ask you about creams with regards to or topical treatments with herbs. Do you tend to, sort of, favor trophorestorative herbs or do you use astringent-type things like Witch Hazel at all or, you know, what do you do there with treating acne? Rebecca: Do you know, I use very, very few topical applications. Rebecca: I use barely any. I mostly treat internally. I treat with herbs that have depurative, alterative, hepatic, lymphatic actions. So things like, you know, Berberis aquifolium, Arctium lappa, Rumex crispus, Galium aparine, Phytolacca decandra, Echinacea, Calendula, those types of actions. That I'll use internally to enhance all of those organs of detoxification that I talked about before. I will use reasonably high dose of vitamin A and zinc to enhance innate immunity and also to speed up skin healing time. Because both of those nutrients are important for new epithelial growth. And let's face it, people with acne don't want slow epithelial growth. They want fast epithelial growth and repair. Andrew: Yes. Now, this is an important point because it seems counter-intuitive, isn't it? You see a tumorous-type look and you go to inhibit that. You know, and yet, you know, vitamin A can help to slow down the hyperproliferation of certain disorders when it's used in massive, massive amounts. But indeed, you use vitamin A, and it has other actions as well. Rebecca: Oh, yeah, it has actions on innate immunity. It reduces sebum production and it helps build new skin cells, new healthy skin cells. And it's also is important for building, rebuilding digestive integrity and so it has a beautiful dual action. Rebecca: And in terms of topical, look, I find mostly people are already putting too much stuff on the outside of their skin already. Usually, it requires me taking things away and say, "Okay, maybe stop using the antibacterial soap on your face or stop using ProActive," or, you know, whatever they're currently using. And I might refer them to someone, look, I have worked with dermal therapists in the past or, you know, beauty therapists who actually just specialize in treating acne. So there's a couple of people I work with. So I may do that, but I find that there isn't necessarily... I mean, I could use things like calendula creams, for example, just to soothe the area. Rebecca: Sometimes I use...well, there's a little bit of evidence that Chinese licorice and Coptis are quite good for the anti-inflammatory end. But again, it's working on that antibacterial theorem and I'm not...I've got to say, and I think it's probably pretty evident in the way I speak, is that I'm just not sold. Andrew: Yeah, I'm with you. Rebecca: That it’s to do with two... It's like, "Oh, this individual, this has too much propionibacterium acnes, that's the problem?" Andrew: Rebecca, what about toxins? You know, we’ve spoken about hormones, and they can be a toxin, but what about things like the POPs, the persistent organiochlorine pesticides, and other toxins? Rebecca: I mean, certainly, I do take note of my patient's lifestyles. What their occupations are, what their occupational exposure is, where they live, etc. And, you know, we try and clean that up as much as possible. Now, some of my patients are adults and are highly coachable. Some of them are teenagers and want to be teenagers. So there's also the balance of what stage of change your patient may be at. I almost always encourage all my patients, whether I'm treating them for acne or anything else, to be eating an organic diet. So at least that they are reducing their exposure to those types of chemicals as much as possible. The test that I do does test for bisphenol A because it's a known really potent xenoestrogen. So I think that's very helpful, but it doesn't test for any others. And normally, I find that people are within range. I only just had a patient recently who was disturbingly well outside the range and I'm not…she's a hairdresser, so I suspect it has something to do with the chemicals that she's exposed to at an occupational level, daily. But I'm yet to figure out where it's coming from in her lifestyle. That really high bisphenol A, because that's disturbing. Andrew: Yeah, yeah. And what about things like skin types? You know, we're well-versed with skin types with regards to how well we're going to metabolise vitamin D in exposure to sunlight. We're well-versed with skin types with regards to skin cancer risk, but what about acne? Rebecca: Yeah, I think it ties into genetics. But genetics at the hormonal level. And almost always when I take someone's case history, they may or may not have a relative with acne, but there'll be some sign of another hormonal disturbance. For example, recurrent miscarriages, infertility, prostate disease, or breast cancer. So there's some indication in their family of a trend toward a hormonal disturbance. And, of course, constitutionally, that will show up in different people in different ways. Rebecca: And my… the tests of the patients that I've done would indicate that that is not the case. It is not the case. And in fact, I have women who have high estrone at the same time as having high testosterone. Rebecca: And so I work on both of those pathways at the same time. Rebecca: And, I can even test for cortisol and metabolised cortisol as well, which is also valuable. Because one of the risk factors that we do know is that stress activates localised androgens, because there's androgen receptors in the skin, and then that increases sebum production. Rebecca: So looking at what someone's cortisol picture I find, is also kind of handy. Because you don't always...Some patients are very, very adept at presenting as cool, calm, and collected when that's not what actually is happening. Andrew: Yeah. The silk iris. Rebecca: Yeah. And so, that's why I can't remember if I've answered your question or not, but that's why I find the testing very valuable. Andrew: I think the lesson I'm learning from you is stop assuming that you think it's all one. That, you know, we've really got to individualise treatment. And I've got to say it's really impressing me. So I've got to ask what about, if you're talking about a localised stress response in the skin. Couple of questions from that. You know, sweating. You know, some people say sweating is really good because it's an excretory organ and therefore it's good. And yet I've seen acne that has been really exacerbated by sweating. Andrew: But I wonder about the type of sweating. Rebecca: The other thing is though, also some people get acne in… their acne gets worse. So they've already got acne but their acne gets worse in locations where there’s clothing rubbing in a particular place. So, for example, caps. Caps across foreheads I notice is a place where, in men, but it is men who would tend to wear caps more. But their acne can become worse in that location. And so… and because they might be wearing a cap while they're playing tennis or something, for example. And so there's perspiration and oil and friction and heat at the same time. So I guess it's just, you know, your typical inflammatory response. But the thing is you're aggravating an area that's already aggravated. Rebecca: So that might be the answer to that. I'm not sure. And I suppose if lymphatics and hydration would play a big part. So I do think perspiration's good and movement is good for anyone who has a skin condition. Because, of course, the lymph doesn't move itself. The lymph need you to be active, for it to move. And it also needs you to be well hydrated. And I think both of those factors are very useful for people who have skin conditions. Because the lymph serves a function. You know, it serves the function of removing debris and waste, but it's also part of our immune system as well. Andrew: Absolutely. What about, therefore, when somebody has got that, you know, cystic acne on the middle of the cheek area, you know, what about mobilising? Not necessarily formalised massage, but just mobilising that area. Does that help in any way or is there no great, you know, measurable benefit there? Rebecca: I can't see that there would be a measurable benefit because you might actually aggravate. Now, having said that, quite a few of my patients do go, on their own accord, to have what's called an extraction facial. And an extraction facial is exactly what it sounds like. It's where comedones are removed. But at least, look, I'm not opposed to them because at least they're done under sterile conditions. So the person who does them does them with sterile instruments, under sterile conditions. And most people with acne will pick their acne and they won't do it under sterile conditions. And they'll trauma the area by squeezing and pushing and doing whatever else they can to try and get the… you know, to remove the comedones. Whereas I figure if they're going to do it anyway, they might as well do it in a controlled environment. Andrew: Yeah. We've spoken about movement, and if you talk about the microbiota, we know that exercise influences our microbiota. It's not just diet, it's also this movement sort of thing. Well, how important do you find these practices are? Rebecca: It's interesting because I don't… a lot of the people who come to see me are already reasonably active. I have to say. So they're already reasonably active. I tend not to have to prescribe that, to be prescribing movement. I find that the area that I have to focus on the lifestyle perspective, particularly with some women, is anxiety and stress management. Rebecca: I find it a much bigger player, not just in their acne, but in their overall health and well-being. But yeah, like I said, cortisol is going to increase sebum production, but it also does have an effect on our microbiota as well. And then our microbiota runs off. So if you're not managing that side of things at the same time, then I suppose you're only going to get...maybe the results won't be as long-lasting. If there's still that background of anxiety and stress. And sometimes the anxiety and stress is directly related to the acne and someone's appearance. It can be directly related to that. Or it might be related to their occupation, for example, if they’re in a stressful job. So that's what I find, I usually am recommending is, yeah, things like yoga, mindfulness, meditation, adequate sleep. I think the entire Western world doesn't sleep enough. Rebecca: So it's just those, I guess it's fundamental foundations. Rebecca: Oh, was in “The Guardian?" Rebecca: Yeah, I saw that. Andrew: Yeah. So, I mean, this was a very interesting story if nothing else. And the psychologist said to drink a bucket load of water. It was two liters a day, wasn't it? Rebecca: Yeah, at least. Minimum two liters. Andrew: Right. And of course, the woman reported, or the practitioner reported, a dramatic improvement in their complexion. What do you think about that as a, you know, teasing that out from an anecdotal onto what you see in patients? Rebecca: ...how water is required for everything, you know. So I think if someone isn't adequately hydrated, and I do tell my patients this, and it's a good way to get them to be compliant with water is, I go, "I'm going to give you herbs that are going to enhance detoxification. If you don't drink enough water..."
Andrew: It's coming out your skin. Rebecca: "...you're going to get an aggravation of your acne." So they become highly motivated to drink two litres of water a day, because they don't want their acne to actually get worse. But it could happen. Andrew: So do you advocate two litres? Rebecca: Well, I don't want to less than 1.5. Rebecca: Yeah, I usually say two because I know that there'll be days where they don't have two, and then they might hit 1.5. And then that's adequate. It depends on their level of physical activity though because some of my patients are really physically active, so they're quite athletic, in which case, I think their water requirement’s higher. Rebecca: But the stratum corneum, the very, very outer layer of your skin, need both water and fat. And in fact, over exposure to water, so over cleansing, showering, washing, etc., removes the water from the stratum corneum. And so it actually reduces hydration in the outermost layer. Which is why I try and discourage all of the, you know, the crazy skin washing that does happen with some acne patients because they've been told that it's due to bacteria and too much oil and to wash away that oil. Whereas really, that oil layer is just as protective. And I think that's another thing that gets missed is the need to actually have adequate oil and water hydration. Andrew: So just in wrapping up there's two, sort of, I guess, base traditional acne treatments. And one of them is the actual essential fatty acids and the other one that I'm thinking of is the minerals or the combinations, zinc, B6, magnesium helps hormonal metabolism. But just zinc on its own is one of the old fames, you know, for acne. With varying degrees of success, how useful do you find them and what dose do you use? Rebecca: Zinc I find incredibly useful and particularly I think in anyone who's had a chronic skin condition, whether it'd be eczema, acne, psoriasis, I think of zinc like iron. Like it gets consumed and it gets stored and then it gets utilised. And if someone has had a chronic skin condition, they've had an increased requirement for zinc, for a very long time. Because they've been building more skin cells than a healthy person. They've had to to keep up. So I find most of the people that I see are zinc depleted and that's fairly obvious usually from their immune health, if not from their skin health. But they tend to also be predisposed to opportunistic infections, and that tells me that, you know, that zinc is depleted. And so I usually prescribe between 25 and 50 milligrams. Rebecca: …that helps to release your own vitamin A from the liver. That's also at the dual, again, benefit of taking zinc. Andrew: Right. That's very useful. Well, you need to write a book because this is brilliant work that you're doing. Rebecca: Yeah, look, maybe I do. Maybe I'll do. Because I think I am very concerned about how people with acne are treated in the common medical model that they...And it's not anyone's fault. Like, I'm not demonising doctors or specialists, but there really is just, sort of, one pathway available to people at the moment. Which is, you know, they go to the GP because they're concerned. And their GP either refers to a dermatologist or starts prescribing themselves. But generally, the pathway is the same, which is antibiotics, Roaccutane, which comes with its own raft of well-known side effects, and the oral contraceptive pill, if you're a woman. And that's the pathway. And I have to say it's unsatisfactory. And it's unsatisfactory for people because then they come to see me because it hasn't worked. It's unsatisfactory because of all the side effects associated with those medicines, both short and long-term side effects. Yes, it's unsatisfactory overall. And I'd say, look, I'm going to be so bold as to say that it actually isn't evidence-based. Like even with Roaccutane, when you look at the trial participants in those initial Roaccutane or Isotretinoin, is that how you say it?.. trials. They were people with moderate to severe acne. And that's what… they're really looking at all of that data now because they can't understand why people with mild to moderate acne aren't experiencing the same benefits. Because the trial participants were completely different. Well, of course they received an improvement because anything would've been an improvement if you had severe acne. Andrew: Yes, that's right. Rebecca, I've got to say I love the way that you've taken what is very often a confounding condition to treat. And it really affects people's psyche, their self-confidence, not just short-term but long-term as well. 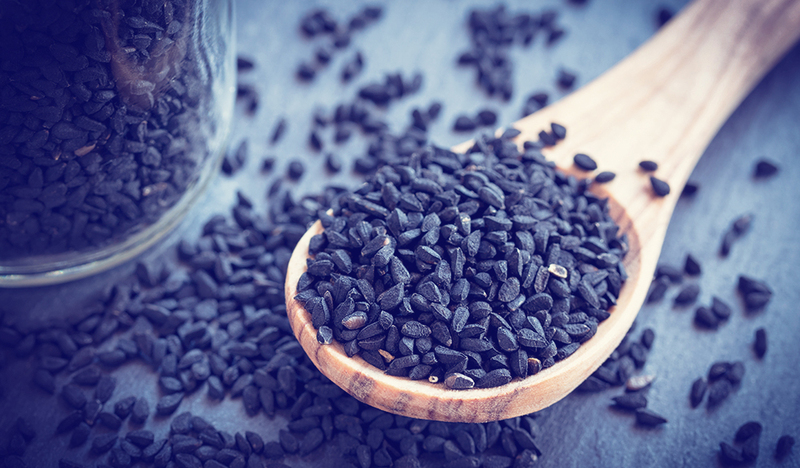 But the thing that I love is that you've taken something that a lot of people would go, "Oh, we have to do these really complicated things," and you're doing it with the naturopathic foundational treatments. And I love it. You know, you're not treating so much the acne as the person in front of you. There, I think you've done extremely well on this, so very well done to you. Rebecca: Thank you. Thank you very much, Andrew. And yeah, I just really want people to be left with that there is an answer, and it doesn't have to be the answer that it is routinely presented to them. That there are other opportunities for solving acne and solving everything else that goes along with it, with the, you know, and you've already touched on it, the self-confidence and anxiety. Rebecca: ...opinion or judgment. But, you know, people with acne have to deal with their acne as well as people's judgment of their acne. But, you know, it's emotionally really damaging. Andrew: Yeah, well, more salient and caring words I've got to say, Rebecca. So thank you for joining us on FX Medicine. Andrew: Cheers. This is FX Medicine. I'm Andrew Whitfield-Cook. Cerman AA, Aktas E, Altunay IK et al. Dietary glycemic factors, insulin resistance, and adiponectin levels in acne vulgaris. J Am Acad Dermatol. 2016 Jul;75(1):155-62. Bowe W, Logan A. Acne vulgaris, probiotics and the gut-brain-skin axis - back to the future? Gut Pathog. 2011; 3: 1.